Gaelic "Ràthais" probably from "rath" - "fort" or "rampart"; though others suggest "ruadh" - "red" from the red river banks. The Cottage Visitor and Resource Centre - independent visitor centre run by volunteers. ​Rothes lies on the Rothes Burn shortly before its confluence with the River Spey, and has spread out along the A941 which is the main route to the town - because of its closeness to the River Spey, the only access from the South. There are alternative routes to the North. Between 1858 and 1968 there was an alternative access to the town, via the Morayshire Railway. James Grant co-owner, with his brother, of Glen Grant Distillery started agitating for a railway from Elgin to Lossiemouth in 1841, and by 1845 south to Craigellachie as well. Though they soon got approval, the financial uncertainties of the time meant that nothing was built until 1851, when Grant's wife cut the first sod. It took until August 1858 to reach Rothes from Orton on the Keith to Elgin line, and the line was extended to 'Craigellachie' in December - though they called there terminus Craigellachie, the line did not cross the Spey, and was renamed Dandaleith when a bridge was finally built in 1863. By this time a direct line from Elgin to Rothes had been opened at the beginning of 1862, and the Orton to Rothes line was closed shortly after the Morayshire railway was absorbed by the Great North of Scotland Railway in 1866. The Elgin to Craigellachie line survived for another century but was closed in 1968. 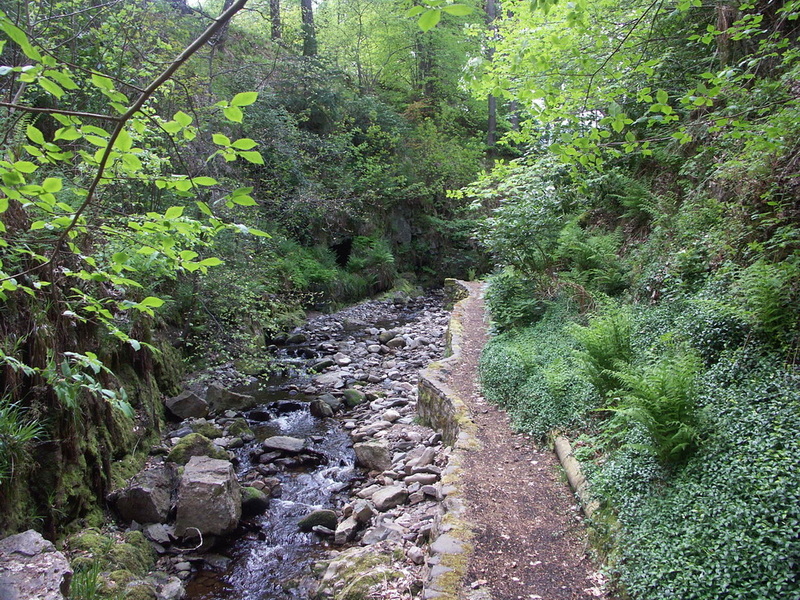 The Glen of ​Rothes is the glen of the Broad Burn of Granty Burn - followed by the former railway between Speyburn Distillery and Coleburn Distillery, relatively flat from the top of the hill north of Rothes on the A941, with Trout Fishery ponds built either side of the old railway line. The other side of the road features a series of quarries and gravel pits. The River Spey cuts a deep valley between the peaks of the area. While Ben Rinnes at 840m towers above Aberlour and Glenlivet, and is by far the highest peak between the Cairngorms and the Moray coast, Ben Aigan at 471m on the opposite bank of the Spey is host to several Mountain Bike trails. The Speyside Way also runs on the East bank of the Spey, abandoning the former railway line that it has followed since Cragganmore. The only distillery on its slopes is Auchroisk. 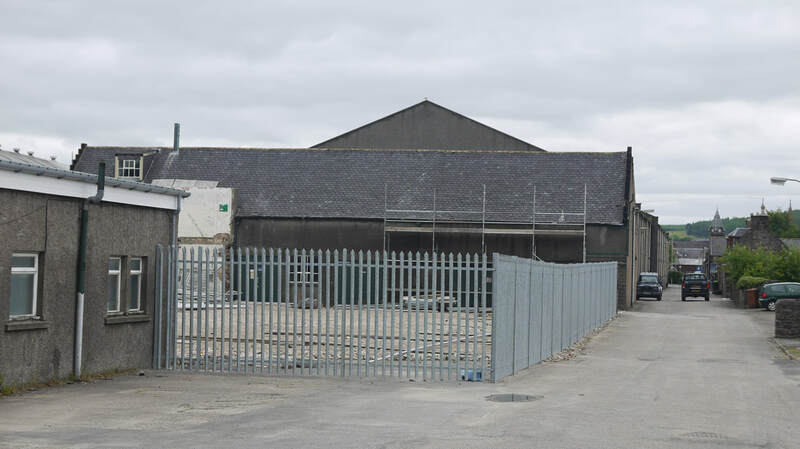 Rothes has 4 active distilleries, as well as recently demolished Caperdonich. Glen Grant is the only distillery open to the public, and also has an extensive garden. (Also the only distillery in Scotland named after a person - actually after two brothers). Rothes Castle was built in around 1200, and would have been establish to command the stretch of the Spey between Craigellachie and Aikenway, where there was another castle, though little is known about it. Rothes Castle was built on land granted to the de Pollok family by King WIlliam I (the Lion), who commanded the construction. Edward I of England is said to have stopped there in 1296. The castle and extensive lands passed to the Leslie family, later the Earls of Rothes in the late 14th century. The Castle suffered in the Covenanters conflicts in the 1640s, and it was demolished in 1660 - a single wall is left. ​The Earls sold up - to the Seafield family - in about 1700, moving to Fife around what eventually became Glenrothes. A planned crofting township running north-south was laid out by the Seafields in 1766. 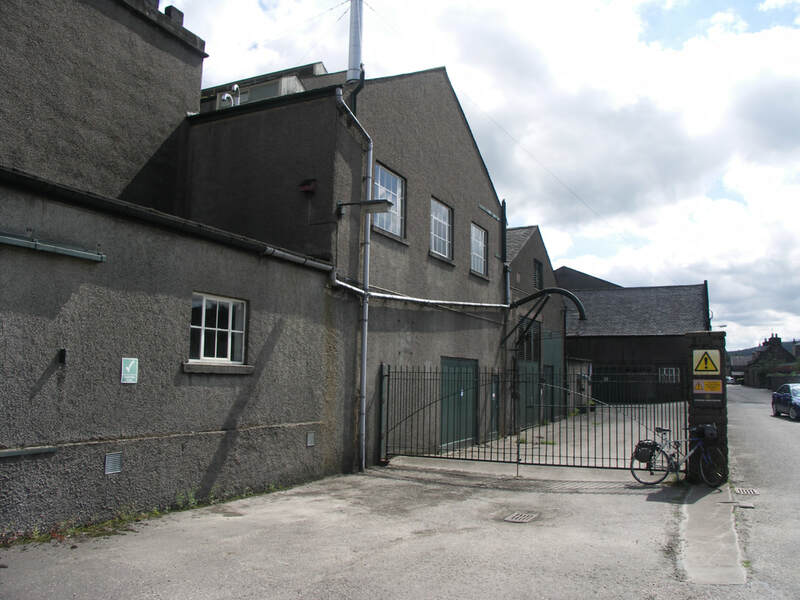 As well as its distilleries, Rothes is home to foremost coppersmith Forsyths - initially specialising almost exclusively in making stills and other equipment for the whisky industry, they have diversified into other industires. 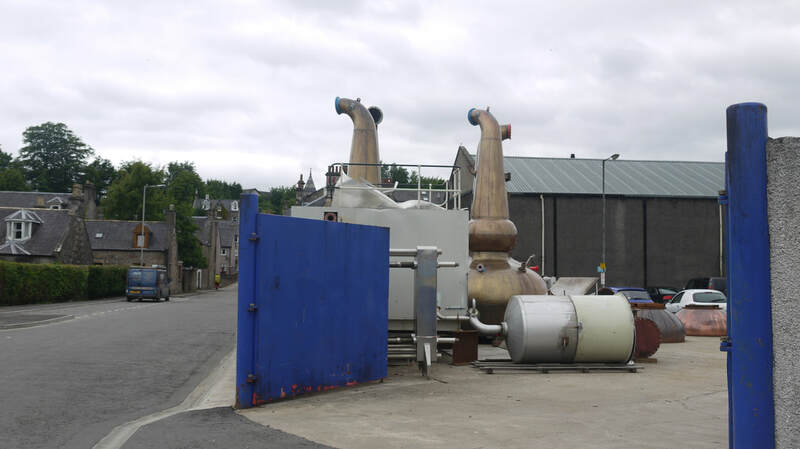 The Combination of Rothes Distillers also has a spent grains plant; an effluent treatment plant and a combined heat and power plant in Rothes which supplies power to 9,000 homes from whisky by-products. 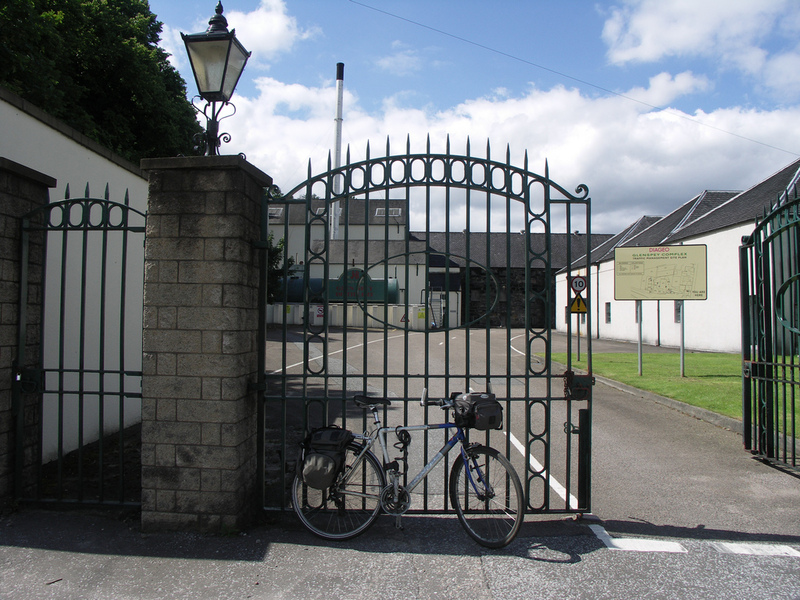 Pernod Ricard, though they no longer have any distilleries in Rothes (they previously owned Glen Grant and Caperdonich) have a large warehousing complex in the town. ​Nearest rail stations are Elgin (ELG) (9 miles); Keith (KEH) (10 miles) Live train times: ELG KEH. Rothes used to have its own station, see left. Named after Ernest 'Toot' Forsyth, who built up the neighbouring coppersmiths after WWII. ​100 malt whiskies in the Malt Bar, which also has a display of bottles and whisky making equipment from Glen Rothes distillery. Banking - nearest in Aberlour. ATM outside Library in Seafield Square.